Yes, you read me correctly…I am now at yearly check-ups. You see, after 8 years I have tried just about everything there was to try, both mainstream and alternative, targeted and tested, and experimental or off-label. It is daunting to look back over my medical records and see that huge pile of things that have not worked. In the end, the Klonopin/Clonazepam ODT has been the only thing that has reliably helped to control my pain. I dissolve 100 mg on my tongue and swish it around before swallowing at mid-morning and unless it is just a bad burning day, I am at a minimal to tolerable level all day and evening long. A nap in the afternoon seals the deal, and I can even get a day without much pain at all and a pain-free evening! Does this mean I am out of pain? There are days where nothing seems to help, and I really don’t know exactly what they are tied to, although years of pain diaries suggest some linkage to hydration, enough sleep and whatever seems to set off my migraines. This time, now that we have “graduated” to once a year refill appointments, I am going to ask my Neurologist about migraine prevention. I haven’t really focused on going after that one since the BMS was center stage, but I am willing to try some preventative options and so we will talk about that this visit. My migraines seem to be somewhat cyclical (first week or so of the month I have more) but if low-pressure fronts are coming in, or if I have some congestion from allergies, I am much more likely to have a string of migraines (sometimes for 8-10 days straight). The thought of being caught without my Imitrex/Sumatriptan sends a chill down my spine. I don’t know how people deal with that much pain for so long, and I find it fascinating that I can deal with the chronic pain of BMS, but migraines are so debilitating that they frighten me more. Maybe it’s because a friend of mine ended up with a migraine related stroke in her late 20s and had to partially learn to talk again. Maybe it’s because my migraines cause body-wide pain and discomfort (ice pick in the eye, nausea, light sensitivity, and an aura of feeling really bad) and aren’t limited to my mouth. Maybe I am just more sensitive to this kind of pain. No answers here, but those will be questions to ask my Neurologist. If you are dealing with a Neurologist, it really helps to write your questions down before you go. Don’t worry that it will make you seem forgetful or anything like that. 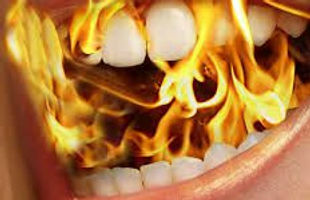 It is a great strategy when you are dealing with Burning Mouth Syndrome, and I have gotten in the habit of doing it with any doctor or specialist I see. There is a lot of information that gets tossed around in a good doctor visit, and you will feel more on top of it when you decide what your important questions are before the appointment. Then take notes while you are talking with them. A good doctor will give you a printed out treatment plan following your visit, but you can’t count on that, or that the information the doctor felt was important is the same data you think is important. Be proactive. Communicate and ask questions. Help your doctor help you, and you both win!